YMCA - EAST MAIN ST.
Lovely. Blog spam has arrived. In any case, did you time this today with the article in the Herald Sun about them thinking about closing the Lakewood branch? It's too bad that YMCA was demolished, but I think with a splash of new color and reconfiguring the base for retail, the 1960s era building that is there could actually be pretty cool. If demolished, this could be one of those 1960s buildings that we would miss one day when looking back at the urban renewal that took place in the 2000s. 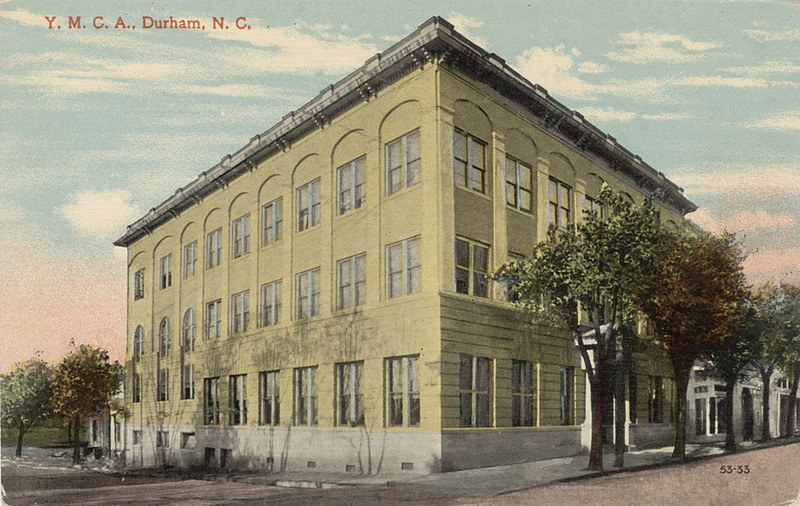 Linthicum & Linthicum claim the Durham YMCA in a Manufacturers Record dated 1907. Given the similarities to some of their other institutional buildings, I think it's quite probable. The picture labeled " Interior 1950's" was the boy's game room. Spent many a fun afternoon there in the 50's. Downtown Durham was so alive then. I have a memory of swimming at this YMCA. My recollection is that the pool was located in the basement and that swim suits were not required. Looking southwest from Roxboro and East Main. The southwest corner of Roxoboro and East Main St. initially was the location of a home, although I don't know the original inhabitant. This house was still in place when the first courthouse was built immediately to its west. Looking southeast from East Main St., 1880s. The first county courthouse is to the right. 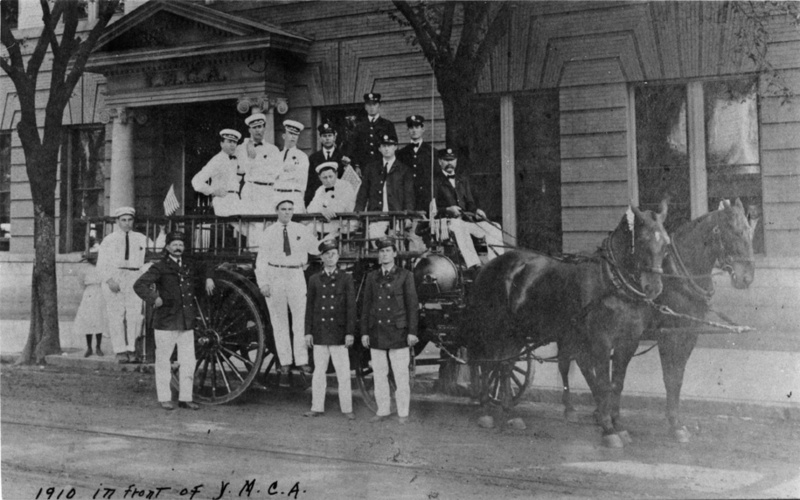 In 1888, the Young Men's Christian Association (YMCA) was established in Durham, with James Southgate as its prinicipal proponent, and the additional support of George W. Watts (its first local president) and EJ Parrish. The small group rented space on S. Church St. offered by EJ Parrish and began raising money for a building fund. However, opposition from local ministers (one of whom, unnamed by Boyd in his history of Durham ridiculed the organization, calling it the "XYZ") doomed the group. It disbanded in 1894. However, through the First Presbyterian Church and George W. Watts, the YMCA was restablished. In 1905, a church-led organization called the "Covenanters Club" proposed a club-specific facility, and George Watts offered to help pay for the cost. A member of the club, JL Conrad, noted that the club would serve only Presbyterians, and what was truly needed was a social club to serve the needs of "Durham['s] large number of young men, members of other churches or of no church." He proposed that a YMCA would be more appropriate. Watts agreed, and consulted with the state officials of the YMCA about re-starting the organization. The group purchased the lot at the southwest corner of Roxboro and East Main from Capt. EJ Parrish for $9000. Watts financed a significant portion of the construction of a new YMCA building on the southwest corner of Roxboro and East Main, completed in 1908 at a cost of $35,000 and supplemented with $25,000 of additional construction several years later. The front entrance on East Main St., 1910. 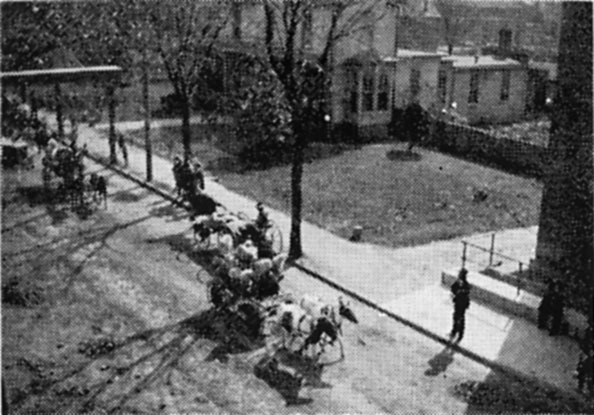 Looking east on E. Main St., ~1917. Note the third First Presbyterian Church building in the distance on the left. Looking southwest from Roxboro St., 1920. EJ Parrish retained the remainder of the land between the original courthouse and the YMCA. In 1909, he built a building containing shops, and in 1911, he built a hotel between this structure and the YMCA, which he also called the Arcade. He built an extensive complex with a glass walled dining room facing Union Station, 62 rooms and 24 bathrooms. Another expansion brought a wing extending behind the courthouse towards Church St., with enclosed gardens and sitting areas to entice travelers disembarking from the station. Parrish attempted to lure the luxury clientele who were drawn to a newer deluxe hotel across the street, the Hotel Malbourne. 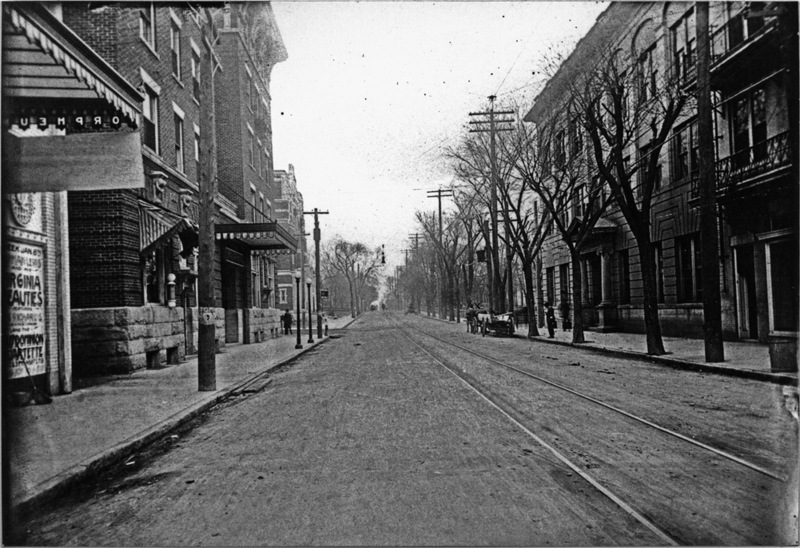 Looking southeast from East Main St., ~1910. Looking west from Roxboro, ~1920. The YMCA and Hotel Lochmoor are on the left, the Hotel Malbourne on the right. The Arcade theater/shops were torn down sometime in the 1910s. The hotel changed hands several times, and served as the public library while the new library was being constructed on East Main St. Looking southeast, ~1940 at the Lochmoor and a bit of the YMCA. The Hotel Lochmoor was sold to the Elks by 1919, who used the building for a meeting place until 1943, when they sold the building to the city, which tore down the structure. The YMCA, looking southwest, ~1950, with the absent Lochmoor. By the late 1950s, the YMCA had tired of their downtown location and tore down the old Pearl Mill Lyceum (school) on the north side of Trinty Avenue near Duke St. to build a new campus. The facility is now a Duke diet facility of some kind. In early 1961, the YMCA sold this building to the county, which tore it down. The building still present behind the courthouse had been used by the county as "Welfare offices", but may have been part of the original Hotel Lochmoor. By 1964, it was gone as well. Looking southwest, 1964. The eastern portion of Union Station is visible, and the Austin-Heaton Co./Peerless Flour Mill is in the distance. In 1966, the county built a new courthouse annex building on the location of the YMCA and Hotel Lochmoor. And later, Durham County Social Services. There are some odd similarities between the YMCA building and this building - most notably the arches at the cap of the building. I don't know if that was intentional. It will be interesting to see what happens with this building with the upcoming construction of the new Human Services Complex. Presumably, the offices in this building will be moving to that structure. As for the YMCA, after a stint away from downtown, having moved on from their Trinity Ave. location to the Lakewood Ave. branch as their sole Durham location, they moved back to downtown in the 1990s, first to a location at the northeast corner of Morgan and Foster Sts., and then, more recently, expanding into a second branch in the American Tobacco complex.